No amount of reading could have prepared me for the Mexican celebration known as Day of the Dead, or Dia de los Muertos, an event that actually spans three days. I found the occasion to be more complex than I had first imagined with layers of meaning; thus, I approach the topic cautiously, aware that I understand only a fraction of what it is about. Although celebrated in various other countries, it is primarily a Mexican holiday. It is a time of celebration, a time of rememberance, a time of mourning, a time of laughter, a time of hope. 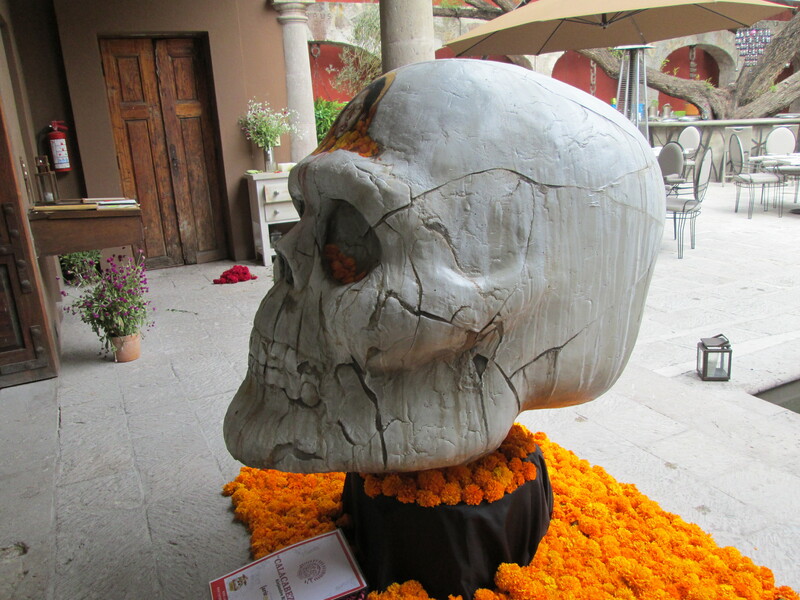 The history of the event is old and complicated, going back to the Aztecs, and is essentially an invitation to those who have preceded us in death to return for an annual visit. Originally a month-long celebration during the ninth month of the Aztec calendar, the Spaniards attempted to abolish it, believing it to be incompatible with Catholicism. Unsuccessful in that attempt, they settled for moving the event to coincide with the Catholic holidays of All Saints’ Day and All Souls’ Day, November 1st and 2nd. From the vantage point of a “gringo,” (I’m actually a “gringa”) at first blush the whole affair can seem somewhat morbid with nearly every storefront decorated in skulls and skeletons together with tons of some kind of red flower and yellow marigolds, sometimes called Flor de Muerto (Flower of Dead), a bloom thought to attract the souls of the dead. 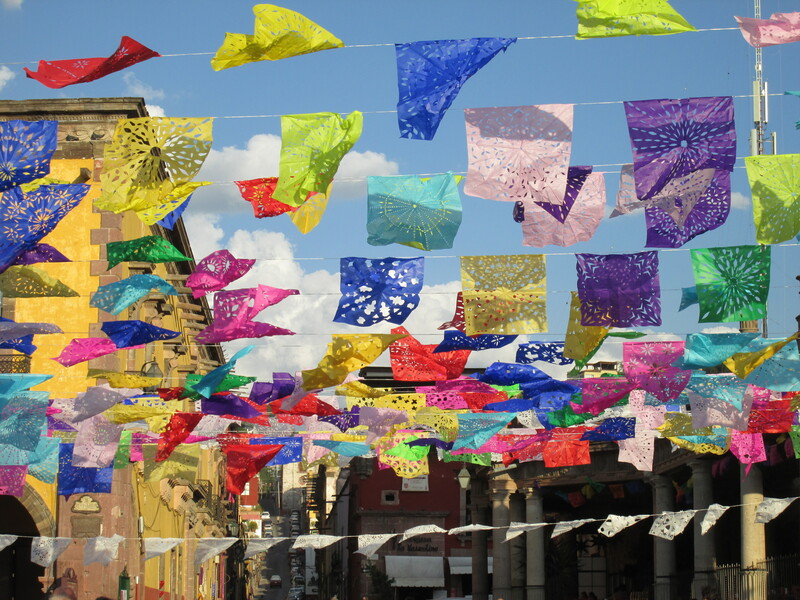 Instead of the red, green and white flags that adorned every street during the Fiesta Patrias in September, now the flags were brightly colored in pinks and lavendar, orange and yellow. On the first morning we went to the garden, Jardin Principal, and found it had been completely replanted with yellow marigolds. Altars were being constructed, a bandstand was being set up, and a miniature graveyard had been constructed in the street. Prominent among the various skeletal representations is “Catrina,” a skeleton of an upper class woman wearing a large hat, created in 1910 by the artist, José Guadalupe Posada. 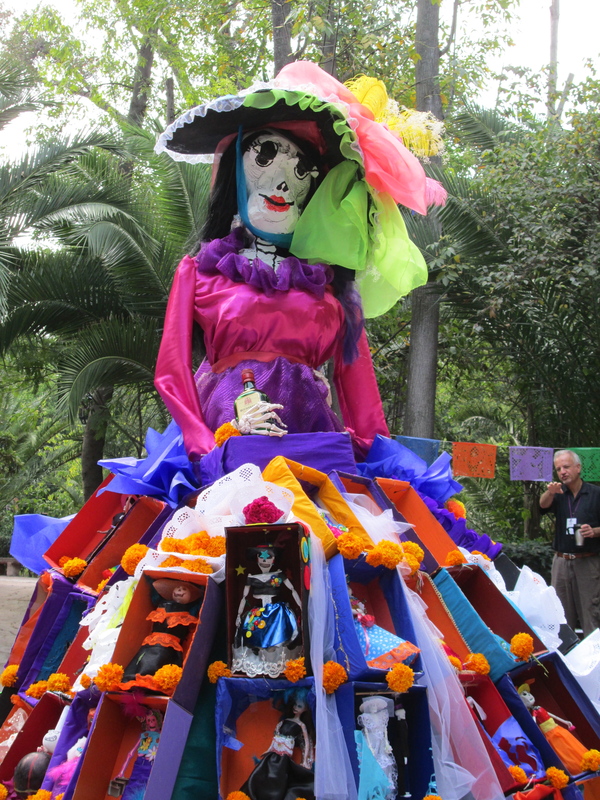 Catrina, also known as “the elegant skull” or “the grande dame of death,” has become one of the most popular figures associated with the Day of the Dead although her popularity is evident year-round. 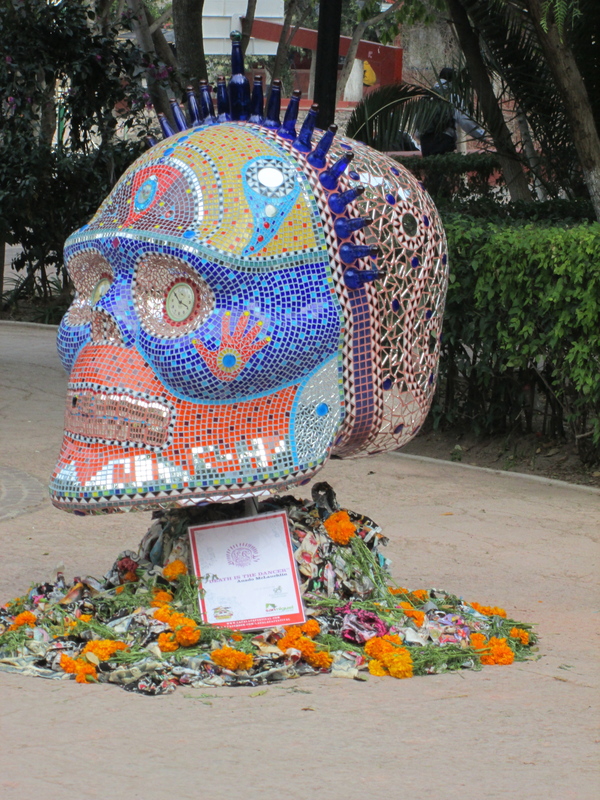 The children of the international school created a replica of Catrina in the park, a photo of which you’ll find below. These representations of death seem to signify not the absence of the fear of death, but rather a way of coping with that fear by mocking death; laughing at it, belittling it. At the same time death is accepted, not as an end but as an almost parallel world. Apparent in everyday life, death is prominent in the native art and even in children’s toys and games, such as the game called “Funeral” in which children pretend to be undertakers and play with toy coffins. But I digress . . . .
Beginning on the evening of October 31st, it is believed that the spirits of the dead begin to arrive to visit their families, leaving again on November 2nd. Plans for these special days are made throughout the year, which include the gathering of goods to be offered to the deceased. 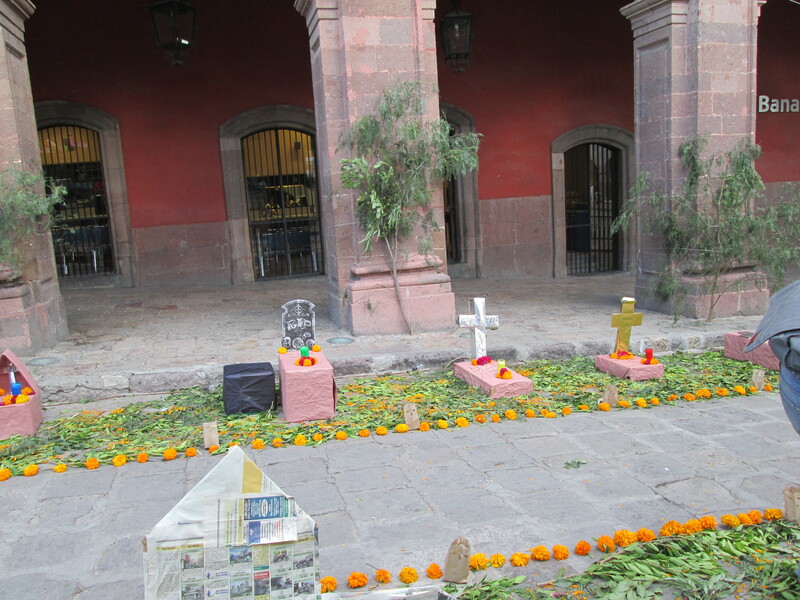 To welcome the dead, many families construct altars or small shrines in their homes or on the street on which they place scores of candles, incense, photographs of all deceased family members together with masses of yellow marigolds. 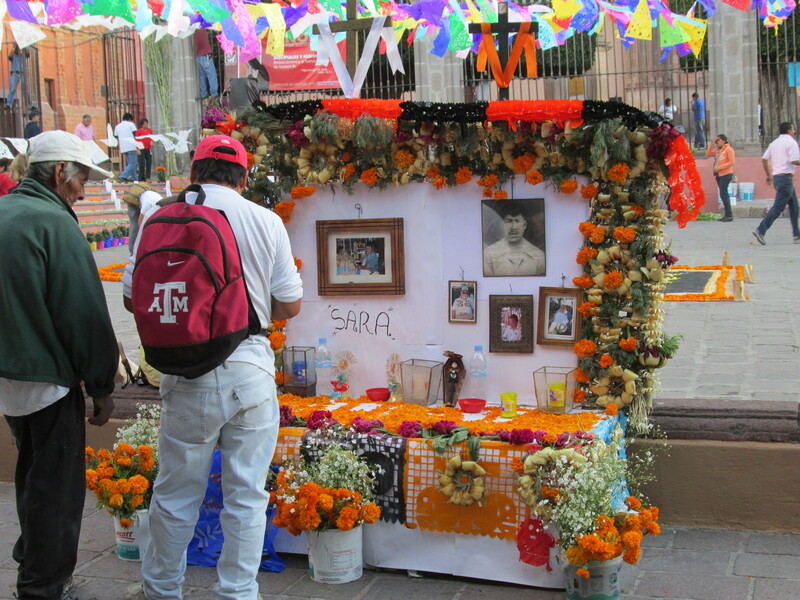 Then they add the offerings, or ofrendas, which usually include the favorite food and drink of the deceased. Some altars hold bowls of fruit or a roasted chicken while others may include a bottle of tequila or a six-pack of coke. Toys are offered for dead children (los angelitos or “the little angels”) and a special bread, called pan de muertos, usually in the shape of a skull, is prepared only for this occasion. Traditionally the family will spend significant time around the altar, praying and telling stories about the deceased. Most believe that the dead are “present” and will hear the prayers, the jokes, the anecdotes directed to them by the living. Another ritual involves going to the cemetery. 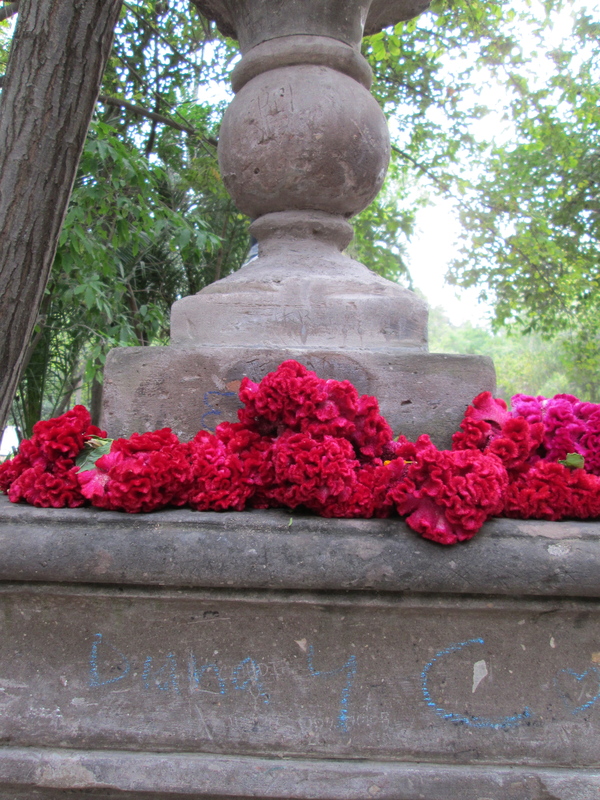 In the days preceding the event, the cemeteries are cleaned, weeds pulled, walls painted, graves decorated. Then the families come with children carrying large bunches of yellow marigolds. The cemeteries remain open all night, for two nights in a row, and some families stay continuously, presumably to be with the souls of the departed, while mariachi bands play and dances are performed to honor the spirits. Pillows and blankets are left out so the deceased can rest after their journey. It remains unclear to me exactly where the spirits go since some families build altars at home, some build altars at the cemetery, and others build altars in both locations. It is a national holiday and banks and many businesses are closed, allowing employees time for these activities. 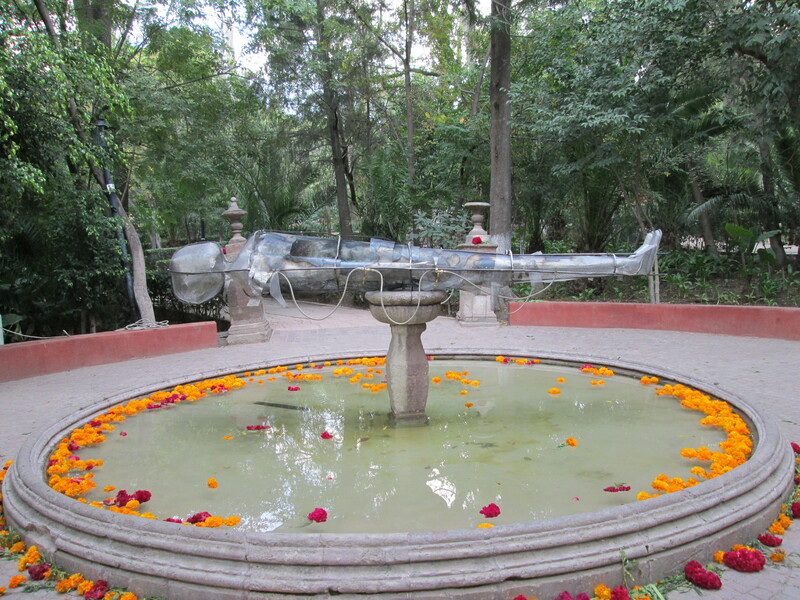 In addition to the altars built in homes and in cemeteries, there are many altars erected in public places such as the main garden and the park. 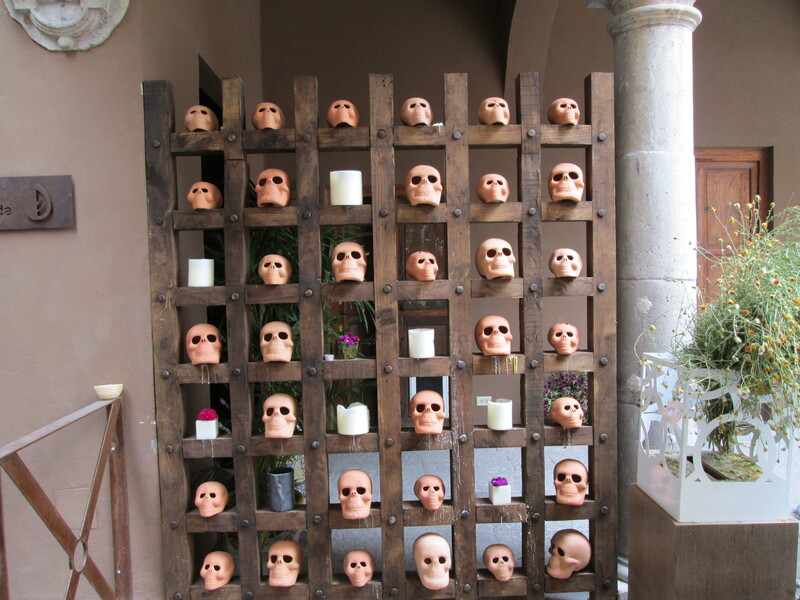 An opportunity for expression by the myriad artists who inhabit San Miguel, I saw remarkable things. As I understand it, Dia de los Muertos allows the dead to live again, to return to their earthly homes to visit and rejoice with their loved ones. And for those still living, the celebration is a way of retaining connection with the unseen world — a world to which it is believed we will all return one day. 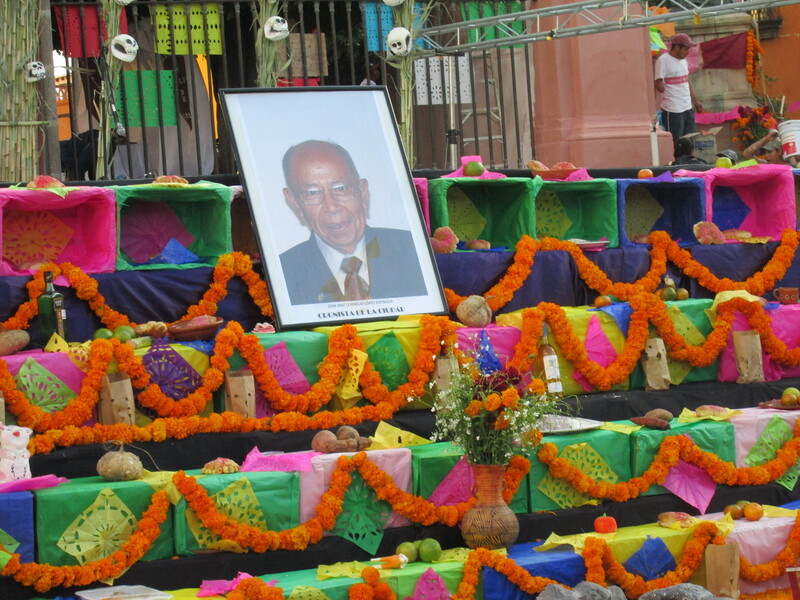 I was deeply impressed with the amount of effort that goes into this celebration, generally borne of love and commitment to one’s deceased relatives. Yet for some the celebration is motivated by fear and/or suspicion for there are many folk tales of untoward things that befall one who neglects his ancestors on Dia de los Muertos. It is said, for example, that if a spirit returns to find no altar, they will feel sad and angry and may seek vengeance on those who have forgotten them. Or even worse, those who ignore their deceased loved ones may fall ill and die shortly after the holiday. A celebration of this dimension is a reminder of how little I understand the culture in which I find myself; I continue to be intrigued. As I write this, it is election eve in the United States. I like the Mexican way: one six-year term and a limit of three months for campaigning. The house that we rent comes equipped with Canadian television, not because the landlords are Canadian but because the Canadian satellite offers the greatest number of channels — something like 250! In addition to Canadian television (which hosts a great number of ice hockey games), we get an NBC station from Los Angeles, an ABC station from Detroit, a CBS station from Seattle, as well as several local New York stations. But as I observed once before, watching American politics from afar takes some of the sting out of it; the distance lessens the pain. From reading my last post you might imagine that by now I have reached new heights in my Spanish studies. Unfortunately it was not to be for just as the class was about to begin I came down with a throat infection complicated by bronchitis. I’m still in the last throes of recovery but expect to finally, belatedly, begin Level 2 Spanish next week. We anticipate spending Thanksgiving, that most American of holidays, with our friends and neighbors, Tom and Barry, originally from New York, and their dog Henry who is Oliver’s best friend. And finally, I close with a weather report. After weeks of gorgeous autumn-like mornings and summer afternoons, it has rained now for nearly two days straight, the longest period of mostly continuous rain since we arrived in April. Although it is not cold by anyone’s standards except perhaps my brother’s (59 degrees this afternoon), there is a chill in the house and I have lit the fireplace this evening. Oliver wants nothing to do with the rain and at the moment is happily curled up next to me on the couch, snoring softly. Sunny skies and warmer temperatures predicted for Wednesday. Thank you Lynne, for your wonderful research and descriptions of this ancient festival. I knew some things about this holiday but you filled in a lot of gaps. I really admire the way you are being involved in the local culture. Good luck with the next level of Spanish classes. We miss you, Suzanne (the other one).